While many of us anxiously await for sustainable energy solutions to take hold in the mass markets, one segment has experienced such impressive growth that it can leave even the greatest cynic inspired. 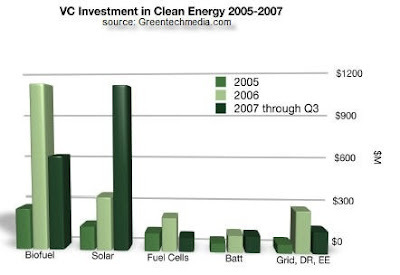 According to recent research from Greentechmedia.com, venture capital investment in the solar industry has transformed from an industry marked by few barely noticed deals in 2004 to what is estimated at $1B in 2007. The numbers that show a tripling in growth have propelled solar energy to the forefront of the greentech market in terms of both its overall capitalization and its competitive intensity. This investment focus has driven innovation in every sector of the $17B global solar industry. The boom has pushed major players in solar such as Sharp, BP Solar, Q-Cells, REC, and others - to adopt an uniquely entrepreneurial mind-set as an attempt to secure their technical and market leadership.